You wouldn't know it watching him take care of his chickens on the family farm, but according to his birth certificate and official Mexican ID, Manuel Garcia Hernandez is 121 years old. Garcia, who may just be the world's oldest man, was born on 24 December 1896, according to his birth certificate from the Mexican state of Veracruz and his official identity card from the National Electoral Institute. He has never bothered calling the people at Guinness World Records to make it official. But if his documents are correct, he is more than eight years older than Masazo Nonaka of Japan, the man who currently holds the title -- born on 25 July 1905. Anyway, age is only a number. Garcia says he doesn't feel a day over 80. He says he only has two regrets in his very long life: losing his father at a young age, and the fact he can no longer work. 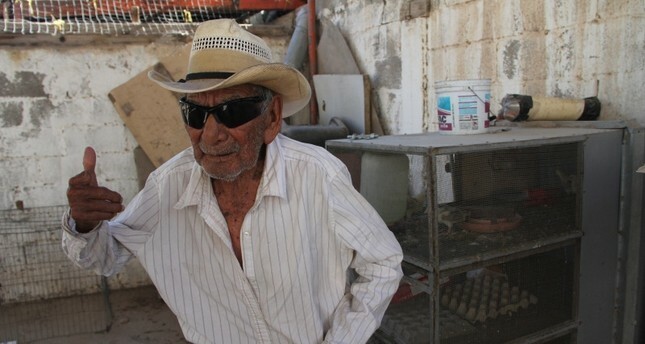 Yet he is impressively spry as he tosses feed to his chickens at the home he shares with his daughter Tomasa in Ciudad Juarez, northern Mexico. "I'm happy, but I do feel tired. I'm making an effort, because if I just lay in bed or sat in a chair all day, then I would get sick," said Garcia, dressed in his trademark cowboy hat and Western shirt. "I feel like I'm 80 years old -- though I'm starting to stumble a bit when I walk," he told AFP. Garcia has seen a dizzying amount in his lifetime, from the arrival of electricity to the invention of television, the Mexican Revolution and the election of U.S. President Donald Trump -- his 22nd American president. He started working in the fields at nine years old. His father, who made and sold his own sweets, died at 35. It still saddens Garcia to have lost him so young, he said. He himself did not get married until he was 45 -- to Rosa Medino Medino, who was just 13 at the time. They had five children, 15 grandchildren and six great-grandchildren, and were married for almost seven decades, until Rosa died eight years ago. After that, Garcia moved north to Ciudad Juarez to live with his daughter Tomasa, who is 54. Tomasa's daughter and her family live next door, and another neighbor, an American, lets Garcia raise chickens in his large patio. Garcia says caring for the chickens has helped keep him alive, and wishes he could work more. "I'd like to be able to work the way I used to, make my living in the fields. But I can't anymore. That makes me sad. I was very hard-working as a young man," he said. So, is Garcia the world's oldest man? Alice Pagan, a spokeswoman for Guinness World Records, said he would have to ask the company to check it out. "We ask for a great deal of paperwork and proof to substantiate claims that meet our official guidelines. We also work with various expert gerontologists and consultants who assist in the investigation of such claims," she told AFP in an email. If Garcia really is 121, he would be not only the oldest man alive, but the oldest man ever, according to Guinness -- beating Jiroemon Kimura of Japan, who died in 2013 at 116 years old. The oldest woman ever was Jeanne Louise Calment of France, who died in 1997 at 122 years old, 164 days. Garcia's skin is wrinkled with age, and he lost a finger at 80 years old when it got tangled in his twirling lasso -- an ancient cowboy's war wound. But he is in remarkably good health: he walks surprisingly fast, his vision is good since he had cataract surgery three years ago -- though the sun hurts his eyes -- and his mind is sharp. He said he hopes to live to 125. The keys to a long life, he said, are sleeping well, waking up early, eating healthy, taking vitamins and work. He gets up every morning at 5:30 am and starts the day with a banana and apple smoothie, oatmeal and two eggs. Then he goes out to tend to his chickens. "I ask God to give him some more years until he has had enough," said his daughter Tomasa. "Sometimes he tells me his candle is going to go out little by little, but I don't think so. He's alive, and I'm happy for that."